Breastfeeding is one of the first challenges faced by mothers of twins. It can be done, though coordinating feedings and making sure that the babies get enough to eat can be difficult. In this article we’ll talk about some of the benefits of breastfeeding and offer some practical advice on how to do it. I read recently that the United States has one of the lowest rates of breastfeeding among developed nations, and that’s really unfortunate. Breastfeeding has many benefits for you and your twins. Health and nutrition. In addition to providing all of the nutrition that your baby needs, it confers natural antibodies that boost your baby’s immune system. In these days of antibiotic-resistant bacteria and hospital-acquired infections, immune systems have never been more important! Feeding convenience. Breastfeeding and nursing in particular is convenient, especially when your babies wake up hungry in the middle of the night. There’s no bottles or formula or checking the temperature – you just hook those hungry babies on! Big-time savings. You’ll understand this when you start buying infant formula. That stuff is liquid gold! 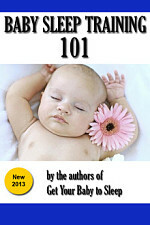 You’ll save a lot of money by breastfeeding, even if you still have to supplement with formula. Possible weight loss. I can’t speak to the proof behind this, but our OB/GYN told us that breastfeeding after birth would help a mother lose weight. The thinking is that you burn a lot of calories when you’re nursing, and for twins especially! It also means you get to eat more post-partum, because you’ll have to keep a high caloric intake to keep up milk production. Bonding time. There are fewer quiet and more intimate moments between a mother and her twin(s) than when breastfeeding. Watch your newborns, talk to them, stroke their cheeks. Cherish these times. Before you know it, they’ll be asking for the car keys. There are obviously lots of good reasons to breastfeed, but it’s not all sunshine and butterflies. Breastfeeding newborns in general can be difficult, and those difficulties don’t go away when you have two hungry mouths to feed instead of one. Making enough milk. This is not unexpected with twins – instead of two breasts for one baby, you have one for each. Sometimes you won’t have enough. When this happens, you can supplement with formula. Plan on doing that more as your babies grow and their dietary intakes increase. Scheduling feedings. This is related to challenge #1, but sometimes your babies will wake up hungry before you’ve had time to produce more milk. And sometimes the twin that’s supposed to eat first is fast asleep, but the other one is wide awake and hungry. These things happen. Nursing positions for twins. It’s not always easy to find a good nursing position that accommodates two babies at once. Especially if one or both of your twins are picky about it. More on that in the next section. The first position (top left) is the double football hold, in which both twins lay on their sides with tummies against you and feet pointing behind you. You’ll need a pillow or cushion to support them in this position; don’t rely on your arm strength alone! A Boppy pillow or the arms of an overstuffed chair work well for this. You can also lean back in a chair or bed and let them snuggle on your belly (top middle) or lay them parallel to one another (top right). 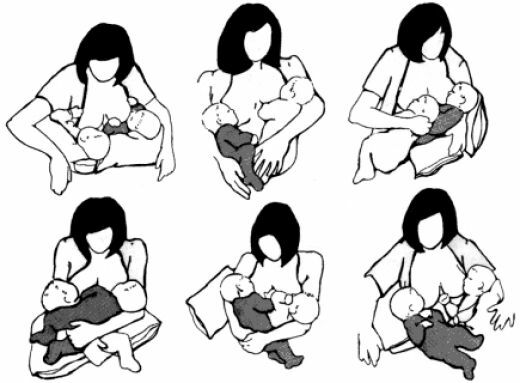 Whatever position you choose, be sure that each twin can latch on comfortably and is able to nurse. Nursing one twin at a time may work better for you, especially in the middle of the night. You can lay in bed and let your twin lay beside you, parallel to your body. This might prove a relaxing position for both mom and child, and makes it easier for both of you to get back to sleep afterward. My Brest Friend (yes, that’s the company name) makes a nursing pillow for twins that’s currently the #7 bestseller on Amazon. The Twins Plus Deluxe Nursing Pillow is designed to support mothers when breastfeeding multiples. It supports your back and the weight of the babies, whether you use the single football, double football, or several other breastfeeding positions. This pillow has a super-soft cover that’s machine washable. The back support is adjustable, and there’s a handy pocket for burp cloths or other necessities. 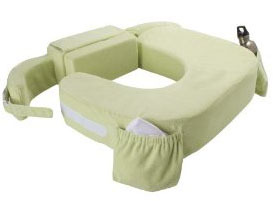 If you don’t have this, a Boppy will do… it just won’t be as nice.